It’s a zero-pitch webinar. All help. No hype. This time we’ll be adding a quick SEO and Performance check too. Most folks stay for the whole session for one reason. The info is just that helpful. Every site is different, so we get to see a wide variety of what’s working and what’s not. This is a live-only webinar. No replay. You have to be in attendance to get your site reviewed. 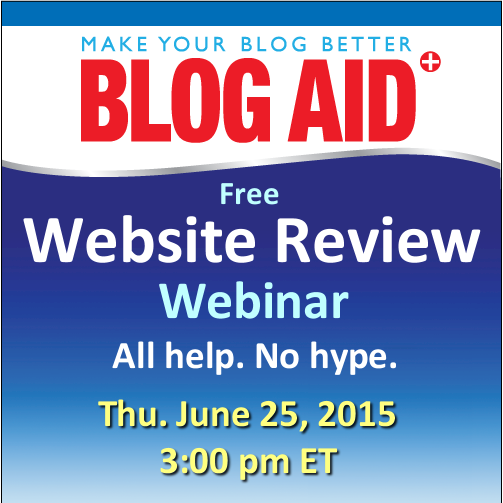 BlogAid News subscribers are always the first to know about my webinars and specials. And, they always get first dibs on the limited slots for reviews and discounts too. Are you subscribed yet?